The Control Centre Solution is designed to equip the monitoring and recovery teams with the most sophisticated system providing all the tools necessary to effect a successful recovery. 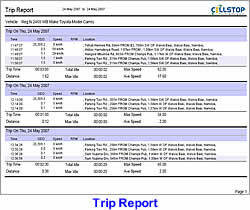 The architecture of the system enables the monitoring and recovery centres to be separated and still provide full and secure access to the vehicles to allow real up to the second monitoring whilst a hijack is in progress. The Control Centre staff consists of well trained and experienced Control Centre Operators, Dedicated Supervisors and Top Class Management. All the Control Centre Staff are available to CellStop customers on a 24/7 basis in case of any emergency. Immediate notification is communicated on the disconnection of the main battery of the vehicle. 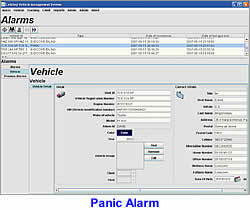 An alarm is sent immediately once the panic button in the vehicle is pressed. A hijack alarm can be sent from any cell phone to the vehicle, by sending an SMS - hijack,pin and the Control Centre will receive the alarm. 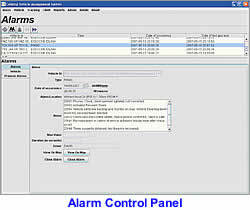 When any of the above alarms are received, the Control Centre will validate such alarm and respond simultaneously. All the alarms are considered to be an emergency and are dealt with accordingly. The vehicle can be immobilised when stationary to prevent uanauthorised use or theft of vehicle. The unit reports into the Control Centre daily to confirm its functionality. The server raises an alarm if the unit does not report in at its designated time. Should this happen the Technical Department will be informed so as to deal with the matter immediately. The highly qualified and experienced Recovery field agents and recovery response teams are available 24/7 to attend to any emergency within the borders of South Africa. Air Support is available in major cities throughout South Africa. Senior Management with exemplary testimonies are accountable for the Recoveries and Recovery network. 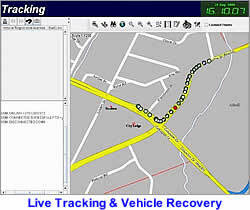 The map (bottom right) shows a live track of a vehicle being recovered. The arrows in the circles indicate the direction of travel. The red dot indicates the panic alarm.